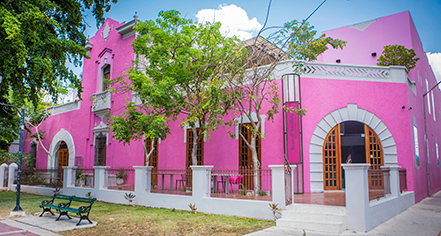 Located on Merida's most prominent avenue, Rosas & Xocolate Boutique Hotel affords travelers a delightful hub for their exploration of the vast Yucatan Peninsula. With 17 luxurious guestrooms and suites, the historic Merida hotel offers visitors an indulgent retreat amid the finest of scenery. Rosas & Xocolate Boutique Hotel serves award-winning cuisine within extravagant spaces, perfect for mingling and enjoying the company of loved ones, including a tequila bar, open-air rooftop bar, and modern bistro. For the epitome of rejuvenation, the Rosas & Xocolate spa emphasizes unique treatments that utilize locally-sourced, natural ingredients to induce a state of pure relaxation. Entwined with the tradition of Mayan culture, this historic Yucatan destination boasts a vibrant history along with eclectic offerings for enjoyment while on a sojourn to Mexico, with a close proximity to an array of destinations. Travelers can delight in the restored artifacts coupled with modern sophistication during a stay at Rosas & Xocolate Boutique Hotel. 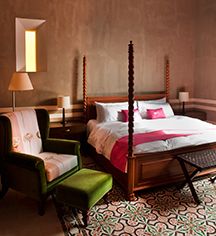 Rosas & Xocolate Boutique Hotel, a member of Historic Hotels Worldwide since 2015, dates back to 1909. Originally uninhabited for 30 years, the original structures housing Rosas & Xocolate Boutique Hotel were initially colonial-style mansions. Accessible Rooms: Please contact hotel for accommodation details. Located on Merida's most prominent avenue, Rosas & Xocolate Boutique Hotel affords travelers a delightful hub for their exploration of the vast Yucatan Peninsula. With 17 luxurious guestrooms and suites, the historic Merida hotel offers visitors an indulgent retreat amid the finest of scenery. Learn more about the History of Rosas & Xocolate Boutique Hotel .